Humans traversed through and resided in the American Southwest for 12,000 years, perhaps even longer. Archaeological research concludes that the first humans of the American Southwest were big game hunters. Paleo-Indians (13,500 to 6000 BCE) would often hunt massive, large mammals such as the mammoth and giant sloth. Archaic Indians (6000 to 200 BCE) resembled the traditional hunter-gatherers of more recent times. Artifacts left by these people include: bones used as tools, stone scrapers, projectile points and grinding implements—various indicators of their hunter-gatherer lifestyle. Early inhabitants were nomadic, and traveled from place to place in search of sustenance. Archaeological records suggest that 9,000 years ago humans withdrew from the northern Sonoran Desert due to droughts and arid conditions that rendered the area completely uninhabitable. These harsh conditions lasted approximately 4,000 years. Due to the harsh climate, once indigenous peoples returned they had to rely on a variety of resources and methods for nourishment. Prehistoric agriculture – often associated with the Uto-Aztecan language family – was one such method. Therefore, it seems probable that Uto-Aztecan speakers moved northward into the area after 3500 BCE. These early agriculturalists planted corn, beans and squash. Usually harvests were minimal so hunting and gathering continued as a means of collecting additional food. Although agriculture supported permanent settlement, no physical evidence appeared until 800 BCE. The prehistoric peoples were often semi-sedentary having bi-seasonal homes. This semi-sedentary lifestyle was required in order to survive in the northern Sonoran desert as there was not enough water or food to live in the same place year-round. Hohokam society began forming around 1000 BCE as groups of people coalesced and practiced agriculture. Whether the Hohokam developed out of indigenous populations in the area or migrated from Mesoamerica is still unknown. However, the ball courts and ancestral mounds created by the Hohokam suggest influence from Mesoamerica, where these structures originated. The agriculture practiced by the Hohokam required an adjacent water source. Therefore, many settlements appeared near major rivers such as the San Pedro, Santa Cruz, and Gila rivers. The Hohokam maximized their habitable land by building large canals that funneled water to fields up to 30 miles way. In addition to agriculture, ceramics developed in the Hohokam formative years as well, specifically the red-on-buff ceramics signature of Hohokam society. Other distinctive features of Hohokam society were a variety of structures including towers and great houses for administration. In the first century CE the Hohokam society began to expand further into the Sonoran Desert. The Hohokam territory became more of a regional system that ran from central to southern Arizona. 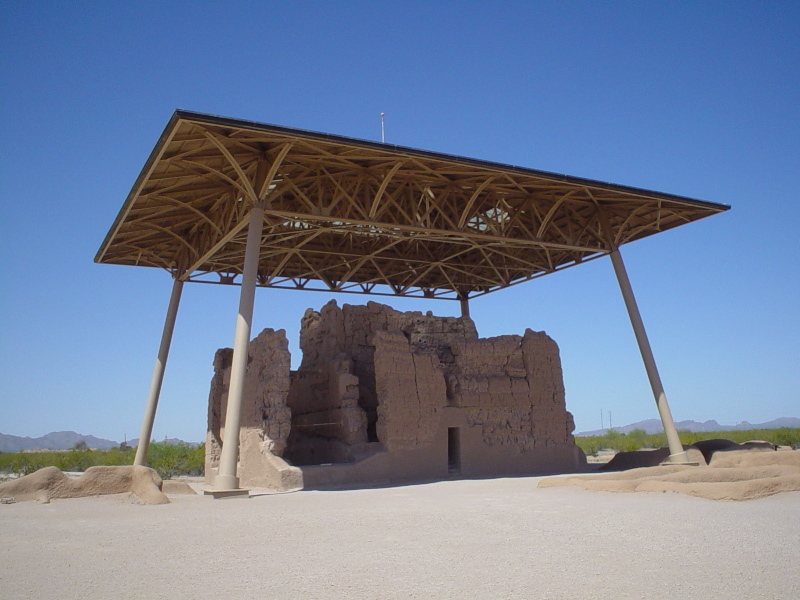 The Hohokam hit their peak between 1100 and 1400 CE. During this period, Hohokam lands reached their furthest extent and many more “great houses” and other great monuments were built. This period not only represented expansion for the Hohokam but also demonstrated a larger shift in settlement. In some areas, new ceremonial mounds and buildings were built while others were abandoned. Shifts in society were stark at this time; consequently some archaeologists postulate that perhaps immigrants from the north introduced new traits. One of the more visible new traits was the shift from red-on-buff ceramics that distinguished the Hohokam to a new polychrome, multicolored pottery. This transition symbolized the waning cultural power of the Hohokam at the time. Near the end of this period most Hohokam sites in the Salt-Gila Basin (near modern day Phoenix, Arizona) were abandoned altogether. Most records show the collapse of the Hohokam tribe to be less than a century before European arrival in the area, and while many explanations have surfaced for the departure of the Hohokam (such as conflict, salinization of fields and flooding) none have been proven. Alongside the Hohokam, but further south in Arizona, the Amargosans developed during the first century CE. Archaeologists uncovered evidence of this group in the upper most strata of the Ventana Cave Floor (an archaeological site in the Tohono O’odham reservation). The archaeological remains left by the Amargosans were corn, pottery, stone artifacts, cotton fabric and basketry items.Agriculture played a lesser role in the Amargosan society than it did for the Hohokam. Whereas the Hohokam had many of their larger settlements around rivers for their large scale canal irrigation, the Amargosans mixed agriculture, hunting and gathering to meet their needs. The Amargosans are widely believed, with the Hohokam, to be the ancestors of the aboriginal populations living in the area today. Many different people have inhabited the northern Sonoran Desert, particularly because it offers many different food plants (saguaro, mesquite, organ pipe cactus) as well as tinajas which are natural rock water tanks found in the mountain regions. The Tohono O’odham people made efficient use of the desert resources, migrating between the mountainous and desert regions based on season and the exigency of water. Archaeological evidence suggests that the Tohono O’odham, who are descended from the Hohokam, have been living in the desert region for thousands of years. The social structure of these societies did not appear to be very formal however. Many were just bands comprising of a single family with no formal leadership except perhaps one individual that might represent the head of the group. Although some experts believe that the area of the northern Sonoran desert was used primarily as a trade corridor rather than as land for inhabitation, many different groups of people adapted and lived in the region from prehistoric times to the present. The influence that the Sonoran desert exerted on these people shaped their culture, religion, diet and even their character which is a reason remnants of these people still reside in the desert today. Jerome A. Greene, “Historic Resource Study, Organ Pipe Cactus National Monument, Arizona,” report for the Historic Preservation Division, National Park Service, Department of the Interior, Denver, Colo., September 1977, 5. Laurie Weinstein, Native Peoples of the Southwest: Negotiating Land, Water and Ethnicities, (London: Bergin and Garvey, 2001) 2. Greene, “Historic Resource Study,” 5. James M. Bayman, “The Hohokam of Southwest North America,” Journal of World Prehistory, Vol. 15, No. 3, 2011, 257. Zdenek Salzmann and Joy M. Salzmann, Native Americans of the Southwest: The Serious Traveler’s Introduction to Peoples and Places (Boulder: Westview Press, 1997) 18. Salzmann, Native Americans of the Southwest, 18. Bayman, “The Hohokam of Southwest North America,” 266. Bayman, “The Hohokam of Southwest North America,” 257. Bayman, “The Hohokam of Southwest North America” 270. Crown, “The Hohokam of the American Southwest” 235. Crown, “The Hohokam of the American Southwest” 236. Greene, “Historic Resource Study,” 6.